Móinín an gCloigeann – the little bog of the skulls. Boston is a tiny village near the eastern edge of the Burren. To the south lies Lough Bunny, a calcareous lake of 480 acres and one of the deepest in the Burren. It contains a wide variety of wildfowl and plants. Turloughmore is situated about 2 miles from Boston Church, and was famous for its racecourse and fair day in the 18th century. The ruins of Cluain Dubháin, or Boston, Castle and Skaghard Castle can be found near Lough Bunny. Today, the ruins of the castles are a reminder of the past sieges endured by its previous occupants. Partially-ruined 16th-century castle. Only the north wall with fragments of attached walls still stand to full height. 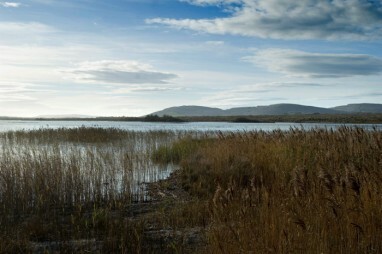 Lough Bunny is a permanent lake located on the R460 from Corofin towards Gort. There are ruins of a castle known locally as Boston Castle, its true name is Cloondoun, Cloonanan, Cloonan or Cloondooan. Lough Bunny is a Geosite. The ruins of the castle are a reminder of the past sieges endured by its previous occupants.